Did you ever wonder what are the benefits of building an application using a centralized store solution, either in Angular or in any framework in general? Often we dive straight into Actions, Reducers and the associated terminology of store architectures, but those concepts (although essential) are simply means to an end. The centralized store architecture is really a set of application design patterns, so probably the best starting point is to be aware of the design intention itself, and what problems the architecture helps solve and how. By understanding that first, we are much less likely to run the risk of misusing the architecture or using it without making the most out of it. Using a store architecture represents a big architectural shift: with the arrival of single page applications, we moved the Model to View transformation from the server to the client. Store architectures have taken that one logical step further: we are now also moving the Model to View Model Mapping from the server to the client. But what benefits does that architectural shift bring, how does it work and how do we tie all these pieces together: Ngrx Store, Actions, Reducers, Selectors, Effects ? That's what we will be covering in this series of posts. What is the best place to get started with Store Solutions? Let's go back to the beginning and to the origins of store architectures: We will go over the original Facebook counter problem that originated store architectures and have a look at what was the problem and how it was fixed. A great place to start getting into the Flux Architecture and store solutions is the original talk where Flux was initially presented because it goes over the original problem itself. 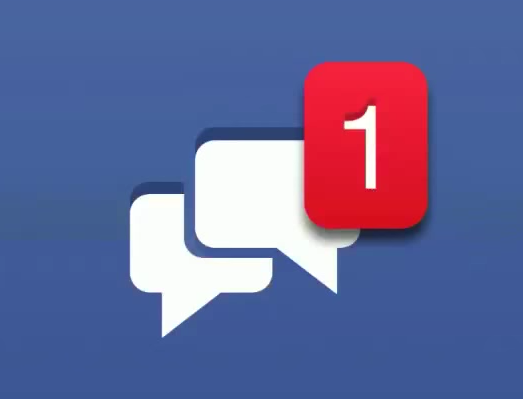 There is a great story behind it: it turns out that everything originated in one big bug that was very visible to Facebook users: a problem with the unread messages counter. Actually, you might remember about it, if you have been using Facebook for a while. It wasn't so much a bug as it was a limitation in the architecture that was in place before Flux, as we are about to see. What was the Facebook counter bug? To anyone other than a developer, this would look like a simple problem to fix. But we have probably all run at some point into this kind of issue: where we keep fixing an apparently small bug but the problem keeps coming back in multiple variants. And this is what happened to the Facebook team: they kept fixing the problem over months and somehow the same bug kept coming back. Either new variations of the bug were found, or the introduction of new features would cause the bug to reappear. How did they fix the problem? It turns out that to solve this problem the Facebook team had to change significantly the architecture of the application. And they shared their new design in an early Flux talk. The introduction of the Flux architecture starts at 10:19 and it really is a must watch for anyone looking for information on store architectures. The original talk goes over stores, dispatchers, actions and all the elements of the Flux architecture. But it's also very interesting to see that the talk covers mostly how the problem was solved, but not as much the causes of the actual problem itself. We know that there was a recurring bug with a counter, and that Flux solved it and that Flux is based on a few main concepts. But what was causing the problem in the first place? ..."brings more real data to the client-side, less derived data". The introduction of Flux fixed the issue and the problem with the counter did not return. So what does this mean: What was the original problem, and in which way did Flux solve it? At its root, the Facebook counter problem is closely linked to a fundamental distinction that exists in any user interface that we will ever build. Notice that Message and Participant are plain POJOs, while Thread contains a property participants which is a map: the key is a participant Id and the value is the number of unread messages for that participant in that thread. It really helps to be able to use Typescript to define these 3 types at the level of the language itself and use them to build the program. But these types are not what we see on the screen, or are they? These types are very closely related to what we usually use to define the database data in our application. If we would be using a SQL database, this could almost be the definition of 3 database tables. Also if we would be using a NoSQL database like Firebase and chose to store the denormalized View Model on the database, even then these 3 domain model notions would still exist either directly in the program or implicitly in the project documentation. It's very convenient to write our program around the very domain model notions that we use to talk about it. There is just one problem: those types do not correspond directly to what we see on the screen. What we see on the screen is not the Model, its actually the View Model - this is an important difference. Sometimes the View Model has a direct correspondence with the model - but most often they are two different models. There is also one extra bit of state which is purely UI-only: which thread is currently selected. In this case, the first one on the list which is highlighted in blue. 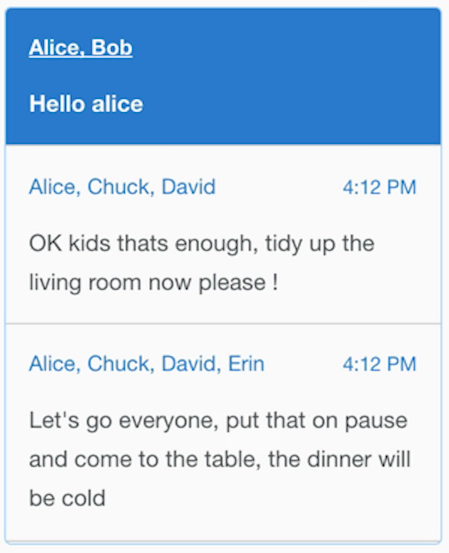 This UI-only state (the currently selected thread Id) is also used by the messages list component to the right, to know which messages to display. More on this UI state later, for now, let's focus on the Domain Data. What is the View Model similar to? Continuing the analogy to a SQL database, the 3 custom types above defined as interfaces would correspond to the output of a SQL query that joins 3 tables. We don't need to use Typescript custom types to define the View Model, but doing so really makes it very clear that its different than the Model. This is all the data that relates to the first thread - including all its messages and participants. What does a View Model look like? As we can see, although the two data structures are similar, they are not exactly the same: The View Model is a transformation of the model, its a query done on the model. For example, we now that the read flag is set to true because we queried the Model data dbMessagesQueuePerUser, and found that there were no messages to be read by the currently logged in user with id 1. So what does this have to do with the Facebook counter? And the unread messages counter! The counter is itself a View Model, it's also a transformation of the Model. The counter is an aggregated view that reflects information that is obtained from the Participant plus all the multiple threads and messages that it has access to. The counter is a summarized view of the Model that needs to be kept in sync with the rest of the view models in the application, and this leads us to the first problem that it's hard to solve without introducing a store. In user interfaces where we need to display multiple View Models of the same domain data (the Model), how are we going to keep everything in sync? Each View Layer top-level component (the list of threads, the list of messages or the counter) needs to display a given View Model of the data, and these multiple views need to be kept consistent at all time. Not every user interface will have this problem, also not all the screens of an application will likely have this problem. But the Facebook home page with the chat window opened and the unread messages counter on top definitively has that issue. But is this the only fundamental design constraint of the Facebook counter bug situation? What if this was a read-only application? In that case, we would just need to load the data, build its multiple View Models and display them and that would also solve the issue. Which leads us to the second problem that the Facebook counter situation has. If multiple parts of the application need to modify the same data, then which part of the application owns the data? Is it a situation of shared ownership or do the multiple components keep local copies of the data, and inform each other on each modification? Can they share references to the same data and mutate it directly? Let's see these options one by one. Keeping local copies of the data? Keeping copies of the data at the level of each component that needs to generate a view model wouldn't work, it does not scale well in complexity. We would soon end up with event spaghetti where all the multiple parts of the application need to notify each other that they modified something. Sharing references to the same data and mutating it? This does not work either because it introduces indirect couplings between the multiple parts of the application. We can no longer reason about one component by just looking at the component and its template - we loose locality. This is because the component data is being modified directly by a completely unrelated part of the application, and as we add more features that mutate the data we will end up with all sorts of edge cases that don't quite work. And that is definitively also a problem that is happening in the situation of the Facebook counter problem. The problem is: who owns the modifiable data, how to encapsulate modifiable data and keep it private to only one part of the program and still make it visible to other parts of the application? Or should we expose it and make it Immutable? That would also prevent shared ownership error situations. But there is one-third problem at stake that does not relate to building a maintainable program, but to the user experience. There would be one simple solution to the problems presented above: we could simply get the View Model directly from the backend, which is actually the case for most applications written today. 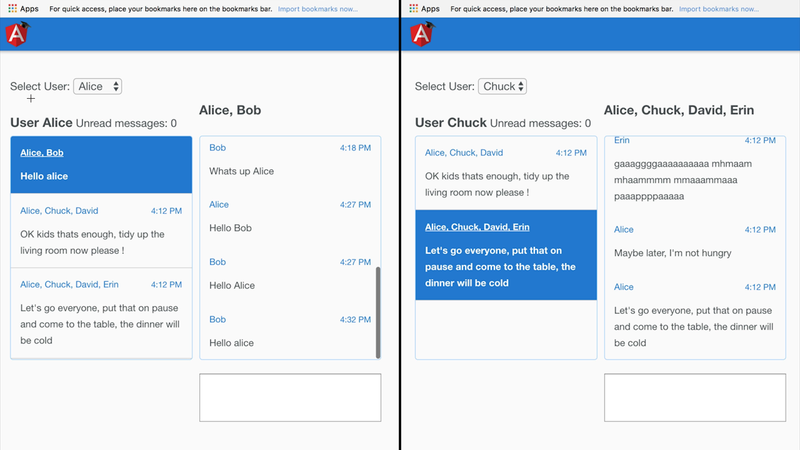 So the Thread Section, the Message List, and the Counter components could get their View Models via separate calls or one large common call to the backend. And then if some modification of the data occurs: send a request to the backend, and simply refresh everything - this way all the data would be consistent. This would lead to those very early types of Ajax "Spinner" single page applications where the data is constantly being reloaded all the time with each user action, which is not a good user experience, especially on mobile. This is especially true for a large consumer facing application like Facebook, where user experience is at a premium. At this point, we have a good view on what the problem was in the Facebook application: the Facebook home screen + chat needed to display multiple View Models of the Same Model data at the same time on the same screen. That data was not owned by any particular part of the application and was being modified constantly by multiple independent actors (the server via server push and the user). Every View Model needed to be kept in sync and consistent without refreshing everything all the time. The main problem was that the usual pre-store solutions of transforming the Model into the View Model on the server and having the backend return View Models to the client do not work well in this situation. Let's now present the Store application architecture pattern as a solution to these multiple problems - and it works really well. The store provides an elegant and maintainable solution for all the problems faced in the Facebook counter problem. If we go back to the Flux talk, let's take the key sentence "bring more real data to the frontend". What does this mean? This is actually the core of the store solution. It means that instead of transforming the Model into the View Model on the server as its usually done, let's instead copy the Model to the client-side, keep it an in-memory client database and derive View Models last second on the client side instead of doing so upfront on the server. Let's break this design down in more detail, and show some code for each part. How are View Models produced? How is the data modified? What data is kept inside the Store? Was this the exact solution used by Facebook? Facebook originally used a solution where multiple stores were used that could wait for each other to get notified and contained one subset of the data. The design above only uses one centralized store (this design was made popular by Redux) so it's already an evolution towards the solution used by Facebook. But the essence of the solution is the same. So let's break this design down step by step and see how each design element looks like. This will allow us to define a client-side in-memory database for our application. The first thing that we want to define is, what type of data will the store keep. This state consists of the user currently logged-in in our chat application, the currently selected thread on the thread list and the current error message displayed if any. On a first look, this way of storing the data might look like repetition, because we are repeating the Id twice: once in the key of the map and the other in the object itself. This way of storing the data is optimized to make the data as shallow as possible and avoid deep nesting and is optimized for "find by Id" queries. This way of storing the data closely resembles a database table in a SQL database, where the primary key is the Id field of the object. These data types define what the data contained inside the store will look like, but what about the initial value of the data? This will be the initial value of the in-memory data, while we don't load the store with backend data. In the case of the chat application, we are going to load the store with the content of an initial request to the backend. How to populate the in-memory database? At this point what we want to do is to get the data via a plain HTTP request from the backend and save it inside the store. The way that we interact with the store is via sending it a command for modifying its internal data in a certain pre-defined way. That command object is called an Action. The action will trigger a modification of the store state in a synchronous and immediate way. What about asynchronous actions? That will also be covered in part 2. Right now we already have the data ready to be loaded in the store, so how do we load it? As we can see, we are sending a command object with all the data needed to the store centralized service. But we don't know what other parts of the application will be affected by this change and how. But what will the store do with this action, how will it save the data? How does the store process each action? Remember, the goal of the action is to modify the state inside the in-memory database in a certain way. Each time that the store receives a new action, it will take the current state plus the action and use both these inputs to produce a new version of the application state. This function is called a reducer because it shares an identical signature to the reduce functional programming operation, and it's simply a way of producing a new store state in response to the dispatching of an action. So what does this function look like? Remember, reducer functions are only a small piece of the puzzle of the design that we are trying to implement. What we are doing here is bringing the Model data to the frontend and keeping it in memory, and the reducer is a way to modify that data in a maintainable way. The output of this object is as expected an instance of ApplicationState, that builds its uiState and storeData properties by delegating their calculation to smaller functions. The reducer function usually has a switch statement, that can be on the action type. Inside it, we are going to add processing logic which is specific of a given action type: in this case we are loading all the data into the store by saving in the corresponding maps per Id. In order to save the data that we received from the backend per Id, we are using the Lodash keyBy utility function. This function would take the data from the backend and initialize the in-memory database. But how do the multiple View layer components consume this data? How to consume the data inside the in-memory database? If a given component in the application wants to be notified whenever new data is available, the simplest way is to have the store centralized service injected via the constructor. As you can see, the store is handled as an observable of application state and is used to derive streams of View Models. View Models are being derived from the Model data in the store at the very last second before injecting the data into the view layer. How to produce View Models from the application state? The store Model data (saved under the storeData property inside ApplicationState) is transformed into a View Model by applying a Selector function. As we can see, the function is simply taking the application state, retrieving the current user and going through all threads in the in-memory database. It's then summing all the threads that have unread messages for the current participant, and it's producing a total number of unread messages. The ThreadSection component is also a good example of a container component: it sets up a series of data streams and passes the actual data to a tree of local components using the async pipe. And so these are the essential elements of the centralized store design, and how they fit together in the overall design goal. How does this solution solve the Facebook counter problem? Let's remember that its all about creating an in-memory client side database which is a user-specific slice of the database, and use that data to derive View Models from it on the client. And with this, we have covered the essential parts of the centralized store pattern. Much more than a set of libraries, the Ngrx ecosystem is really a set of application design patterns: Stores, Actions, Reducers, Selectors those are all means to implement those patterns. To better understand those concepts and know how they all fit together we propose to start by learning the centralized store pattern itself first, and then drill down from there into the specific implementation details. All the store related concepts like Actions, Reducers, etc. are simpler to get into if we approach them as means to implement an overall application design. The centralized store design is very effective at solving many problems that are hard to impossible to solve otherwise, and it does so by introducing some architectural trade-offs. To see a sample application of the store pattern in action using ngrx store and many other libraries of the Ngrx ecosystem, have a look at the latest Ngrx sample application. Stores are not only about the client though, using an in-memory database that stores real Domain data also opens up the possibility of building more reusable backends, that emit Model data instead of View models. A store is a great combination for GraphQL backends for example, where we can define with each request what exact Model data we need - the endpoint does not return a pre-defined data structure, unlike traditional REST endpoints. That would mean that we could build only one single backend for our system, used by both the UI and also third-party services, which is currently not the most common situation. Usually we end up building a UI-specific backend and a separate REST backend for third-party integrations. By moving the mapping from Model to View Model from the server to the client and giving query language capabilities to our backend we could now instead build one single reusable backend used by both the UI and third parties.